I did it again, grasped hand after hand, received hug after hug in a receiving line. Few things are more draining for the introvert than the receiving line. We do it — I do it — for people I love. The receiving line for my mother’s memorial service stretched out and curved into another section of the building so I could never see how long it was or if the end was near. I stood near my father who insisted on standing even though a chair was placed right behind him. Even people I knew fairly well helped me out by saying their name — and it was such a help. My mind was overbooked and understaffed; everything was hard. A woman took my hand in that two-handed clasp of sincerity. “Jane Forbes Clark,” she said, and I looked up, immediately recognizing her. One cannot grow up in Cooperstown without knowing the name and face of the woman who is now at the helm of so many organizations in our area. She sits on the stage at the Baseball Hall of Fame induction ceremony with the Hall-of-Famers and welcomes everyone to our town. Her picture is often in the newspaper, accompanying stories about grants given by the Clark Foundation or expansion happening at Bassett Hospital or the Clark Sports Center or the Baseball Hall of Fame. And that is just a tiny, tiny tip of a very huge iceberg. “I wouldn’t have missed this,” she said, and she moved on to speak with my father. She had met my mother, I think, through my father’s work on the Board of Trustees for Bassett. But she came to my mother’s memorial service. It’s kind of crazy how much that meant to me. My mother was a nurse who gave up her career to raise a family. She volunteered in many community organizations, and when my youngest brother was independent enough, she worked a few days a week for the Red Cross. At the end of the day, though, my mom was a mom. It’s not a glorious job. People don’t ooh and aah over your accomplishments. It certainly doesn’t pay well — in money, that is. But Jane Clark saw fit to honor my mother by coming to her memorial service and waiting forever in line to offer condolences to my father. She was warm and gracious. 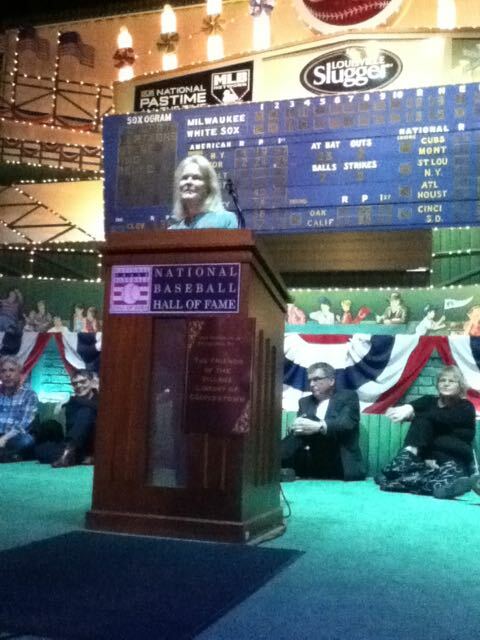 Last night, Jane Clark spoke at the Baseball Hall of Fame’s Grandstand Theater about her family’s legacy in Cooperstown. I was part of the crowd that got in to hear her. My husband and I volunteered to sit on the floor so that others could have seats as they tried to squeeze as many people in as they could. Still, over 100 people were turned away. She spoke for about 20 minutes, methodically explaining the history of the three main Clark organizations involved in Cooperstown: the Clark Foundation, the Scriven Foundation, and Leatherstocking Corporation. She rattled off some astounding facts and figures, most of which I don’t remember because once someone is talking about millions or billions my brain shuts off — that kind of money is incomprehensible to me. Over 11,000 students, though. I remember that number because that’s how many students have been given college scholarships (totaling millions) by the Clark Foundation — and I was one of them. In the Q & A that followed, a less-analytical, less-statistical Jane Clark emerged. She laughed and told stories. Here was the woman I had seen at my mother’s memorial service – warm and friendly. Many people didn’t ask questions; they simply said thank you. “Thank you for the emerald necklace of open space around Cooperstown.” ’tis true — we have the Clark family to thank for the adjectives of bucolic and pastoral used to describe Cooperstown. “Thank you for the Clark Sports Center.” This woman went on to tell of how her son (or was it grandson?) wondered what children in other towns did without a Clark Sports Center. She told stories of how the Baseball Hall of Fame came to be in Cooperstown and why Kingfisher Tower was built. Fascinating lore — even better hearing it from her lips. When it was over, I approached her to give her my own thanks. Not for the scholarship, not for the green belt which borders my father’s land, not even for the Clark Sports Center where I work — I thanked her for coming to my mother’s memorial service. Some things are worth so much more than money.